Married At First Sight’s Jessika Power and Daniel Webb went ‘Instagram official’ on Thursday night…. before swiftly deleting the evidence. And now there appears to be more evidence that the lovebirds continued their relationship in the real world following their TV affair. A Snapchat by an age-eyed fan surfaced on MafsFunny on Friday night, which showed the reality stars enjoying a moment alone on their date night. 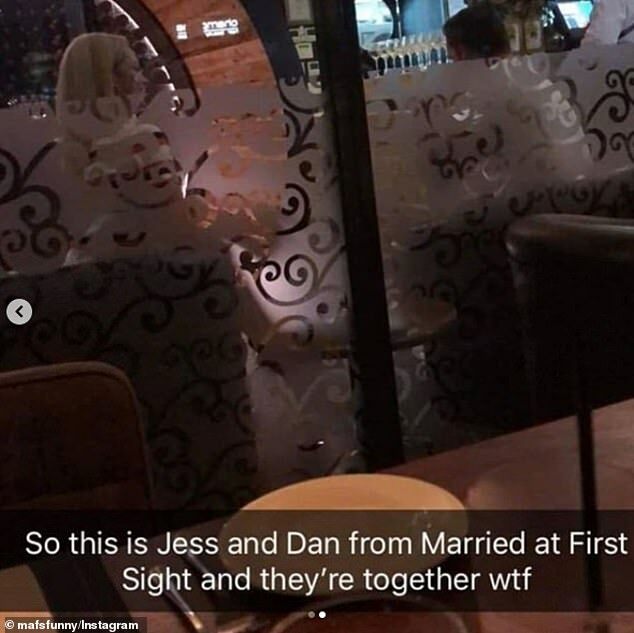 ‘So this is Jess and Dan from Married At First Sight and they’re together wtf,’ the text on the image read. The popular MAFS fan group claimed a fan had sent in the image on Thursday night. Jessika, who has been having an ‘affair’ with Dan on the reality program, mysteriously deleted the photo from Instagram Stories not too long after posting it. Jessika, 27, and Dan, 35, looked very much together in the photograph, which is the first ‘official’ snap of the pair as a couple outside of their appearances on MAFS. In the photo, Jessica, wearing a fitted striped dress and clear heels, presses herself against her hunky man’s chest and beams. Dan, also smiling, wears a white shirt and cargo pants, looking relaxed in Jessika’s company. The pair seemed ready to make their romance official on social media by appearing to confirm their romance to their fans. However, it’s possible the couple could have been concerned that they may spoil the outcome of Sunday’s upcoming commitment ceremony by having shared the photo, and it has since been deleted. The pair, who are ‘cheating’ on their partners, this week hatched a plan to stay together and stay on the show. During Wednesday’s episode, Dan revealed his plan to ask the relationship experts if they could continue on the show together. ‘I’ve come here to find love, and find the girl that I want to introduce to my son,’ gushed Dan to Jessika before admitting that girl he’s been dreaming of is her. At present, Dan is ‘married’ to Tamara Joy, and Jessika is ‘married’ to Mick Gould – with neither of their partners having any idea of their secret romance.